Thermostat devices are getting smarter and allowing us better and more intelligent control over the air temperature in our homes. 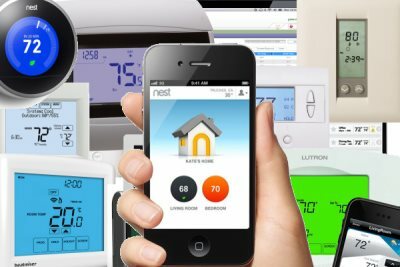 The smartest of them all are now not only WiFi Programmable, but also intelligent devices which learn your patterns of heating and cooling in the home and adjust themselves accordingly, making it much easier than ever before to have the temperature just right at all hours of the day and night. Forgot to turn down the furnace before you left home? No problem, use your smartphone to tell your WiFi thermostat to turn it down, or better yet - get one so smart it learns to turn itself down. You can recover the cost of your WiFi Thermostat in just 2 years or less - that compares favorably to the length of time it takes solar panels to pay back their cost. The Government's Energy Star website points out that proper use of a programmable thermostat can save you $180 per year in energy costs (see details here). This also means that the less energy you consume, the better off the environment is because you are responsible for less pollution - particularly green house gasses. This can be true whether or not you use fossil fuel heating appliances yourself because much of the electricity you get from the grid comes from fossil fuel burning power stations. Which Thermostat Should You Get? It can be a bit confusing with so many brands with different features available, so I've built the Smart Thermostat Comparison engine. When a product is relatively new like these are, then the best approach is to go for one of the leading brands. I've helped make that easier for you with my article about The Top Rated Thermostat Manufacturers which is backed up by data from a leading clean technology market research company. For information about other intelligent gadgets and equipment for use around the home see Smart Home at Totally Home Improvement or Carbon Monoxide Detector Reviews. Copyright © 2013 - 2019 All Rights Reserved Unless Otherwise Stated. Hosted by Bluehost.